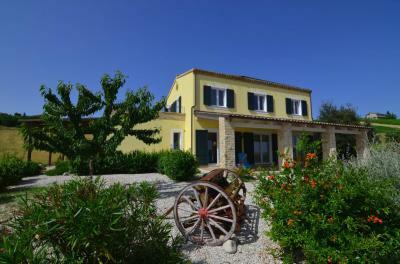 Surrounded by a beautiful park, fully renovated farmhouse of about 225 square meters on three levels. The property has on the ground floor a large living area with wood stove, kitchenette and bathroom. 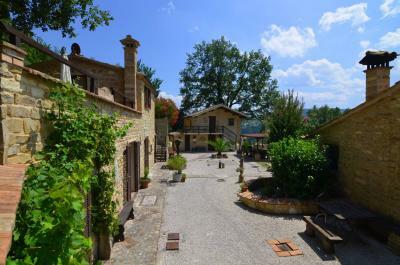 From the ground floor it is also possible to stay in the two typical outdoor portico from which you can enjoy a fantastic view of the valley overlooking the building and the historic center of Ripatransone. On the first floor there are three double bedrooms, one with en-suite bathroom and a shared bathroom. The building also has a basement used as a cellar and storage room accessible internally from the ground floor. The house in question is in excellent condition, built in 2002 complete with all the services and facilities. The property is provided with a surrounding land size of 34000 sqm, mostly flat around the house with a parking space or area for the construction of a swimming pool. There are about 50 olive trees and many plum trees and almonds. Access to the property is by a wrought iron gate with electric control and private driveway completely paved. Very comfortable. 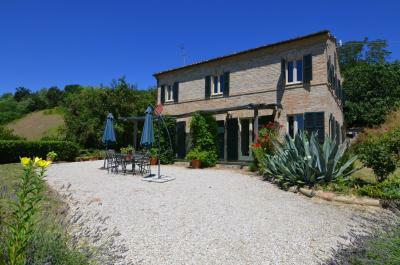 Located in a beautiful countryside, this house is ideal for who looking for a stable housing or vacation, immersed in the tranquillity, in the green hills of the Marche but only 8 km from the Adriatic Sea.